Meet our neighborhood flock of sheep. We can see them from Audrey's bedroom window. 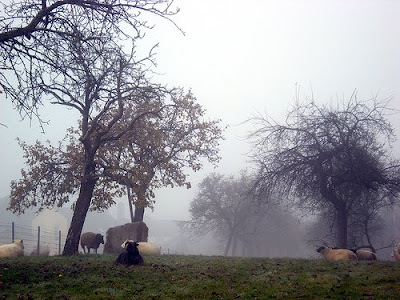 The mist you see in the picture is very typical of mornings in Luxembourg. Although the weather in Luxembourg is often compared to that in Seattle, we've found it to be much colder. It has been between freezing (O degrees Celsius) to 2 degrees Celsius since we got here. During the snow it was down to -2 degrees. Brrrrrrr. very beautiful...COLD....but beautiful!! LOVE EUROPE. Oh, those ornament sticks are great and they brought back memories of when we lived in Germany. Such a great festive, yet simple, idea!! We loved putting tons of christmas lights outside. No more than the avg american, but it was a lot for the Germans! So fun. Wow- very beautiful and peaceful!